Bonner, Rev. Thomas Joel—”Was born in Monroe Co., Ala., Dec. 23. 1821. His father, William Bonner, had moved from Cedar Springs, in Abbeville Co., S. C; afterward located in Wilcox Co., Ala., and later in Freestone Co., Texas. Thomas spent his early years on the farm. He attended Miami University a while, but graduated from Erskine College in 1843. The same year he married Miss Amanda Posey, of Abbeville Co., S. C. His theological studies were prosecuted under Rev. Joseph McCreary one year, and in Erskine Theological Seminary. He was licensed by the Alabama Presbytery in 1846. For a number of years he was S. S. for a vacancy in Lowndes Co. and occasionally visited vacancies in Georgia and Mississippi. At the solicitation of friends and kindred, he moved to Freestone Co., Texas, in 1859. Some time before this he was ordained sine titudo by the Alabama Presbytery. He preached regularly in this new field, always loyally maintaining the principles of the church of his choice. For perhaps 15 years, he never saw the face or heard the voice of an Associate Reformed minister, yet always had a lively interest in the enterprises of Synod. About the year 1865 he organized a Psalm-singing church at County Line school house, near the line between Freestone and Navarro counties. This church was temporarily placed under the care of a presbytery of the Presbyterian Church in the U. S. The congregations of Harmony, Richland and Ebenezer come out of this organization. 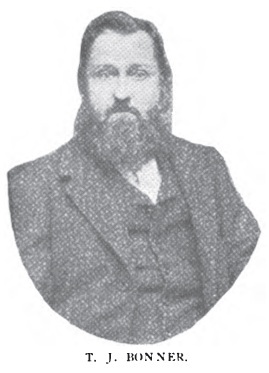 In the organization of the Presbytery of Texas, at Harmony Church, Dec. 9, 1876, Rev. T. J. Bonner presided and preached the opening sermon. He, with Revs. J. M. Little and W. L. Patterson composed the Presbytery. Failing health compelled him to retire from the active work of the ministry about the year ’79. He died June 13, 1895, at the home of his son, W. B. Bonner in Wortham, Texas. He left a widow and six children.